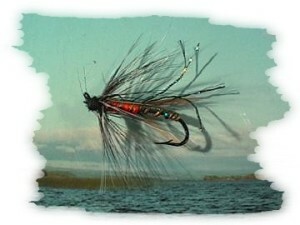 At the end of a fly tying session in July 1995, I found bits and pieces left on the table which inspired me to make a fly. The very next day there was a flood in the Eany and the new fly accounted for 3 salmon in as many hours. Needless to say: I went home after that and tied more. Four well known anglers now regularly fish the Eany and Owenea with the Masquerade, and catch lots of salmon with it. Double or treble hooks ( preferable trebles ) in sizes 8 to 14 should cover all eventualities in the North-West. The well known holiday angler of the region, Fritz, and his wife Ulrike, were three days late. I had no telephone and communication therefore had been a problem. So, they were happy to find me pottering about in the garden. There was great water in the river these last days, you know! my reception speech was slightly reproachful and straight to the point. I know, I know, came the unhappy reply from Fritz, but I've spent the last three days more or less in bed. We had this great feast on shellfish, oysters, mussels, prawns and I must have overdone it, or maybe one of the mussels was gone off; it was really bad. A pity, the Eany fished really good. There is still water in it, remarked Fritz as we stepped into my porch, I thought we could go down, have a picnic and try it for a while. Great idea, I smiled happily, I'll go and put my stuff into the car. Good, and I need some water, have to take a stomach pill, it's still a bit sensitive, Fritz took off his glasses, put them on the table in the porch and fumbled in his pockets for the pills. When Ulrike helped me to carry my stuff down to the car, we heard her name screamed twice, turned around and saw Fritz standing in the open porch door: Oh man it's bad: I took a sleeping pill instead, accidentally! Go to the toilet, put the finger in your throat and puke it out, was the advice from his wife and he went promptly to follow it. My gear packed safely away in the boot of the car, on our way back up to the house, there was another sort of scream; muffled, since it came from behind the closed bathroom door. Ulrike said his name twice again and shortly after, that the man emerged from the bathroom, the pill didn't come out, but my denture did. I could just grab it before it slipped behind the bend; man it was bad! The next place the well known German holiday angler could be seen, was lying in a meadow, right beside the Eany River, snoozing it off.